Thanks to everyone who has offered advice and information, thanks to this, i had a day off work today and set about trying to check everything people said, spent most of the day checking all the vacuum pipes and hydraulic hoses and took off every electrical connection i could find to clean up and put back and rewired various bits that looked a bit dodgy ..........and hey presto!!!! it seems to be working!!! took it for a long spin this afternoon and everything is back to normal, it's not perfect (still thuds into reverse etc but then it's always been like that!) but fingers crossed it seems to be ok. Thanks so much to everyone who has helped you've been a godsend!! Post a pic of your carby setup, and check how many "exposed" threads are on the CV adjustment screw. You can play around to suit your tastes. as promised some pics of my engine bay, if anyone can tell me if there is anything out of place that would cause jumping into reverse please let me know or anything else not quite right! Your CV adjuster screw has been screwed all the way in however :? . Generally the stock setting is 2 full threads exposed from the top of the cap. Put another way, when you see thread, 2 1/2 turns more out. The adjustment is meant to be between a 1/4 and 1/2 turn either way. A little worrying as having it screwed so far down would put some real strain on your CV's vacuum diaphragm and reducing valve. Is your clutch slow to engage? 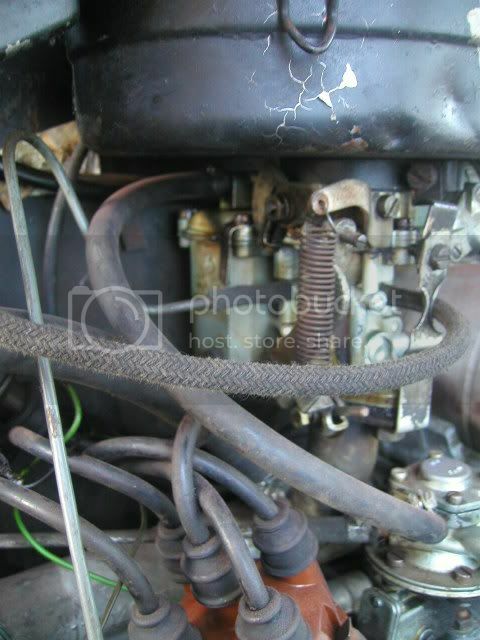 Pull off the small vacuum line from the carb to CV at both ends. Make sure the hole in the carby vacuum fitting is OK.
Next, undo the brass fitting at the CV and make sure the hole is clean in it. It is a tiny one. After that (and this is tricky), put the brass fitting back on. Reach up underneath and feel the hole there with a protruding "knobule" inside. Push up all the way, then put a finger over that brass fitting. Let go a little and the "knobule" should not spring back against your finger, or it should very slowly. The total movement is only about 5mm, so try a few times to get the feel. Last, what does that carby say on the side of the float bowl? You may need to finely adjust it correctly. 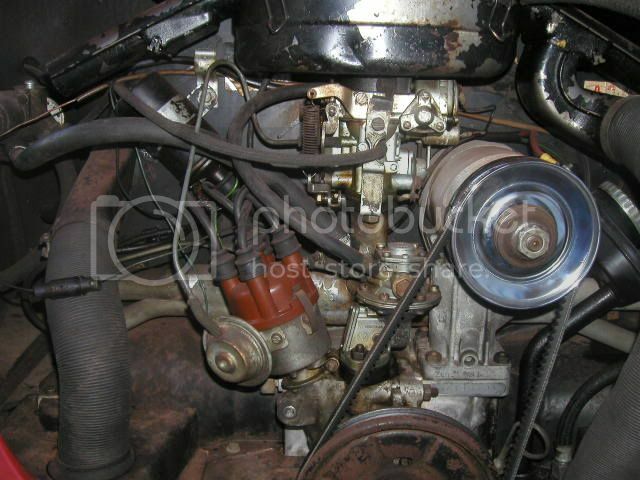 I have a 1968 Auto Stick, I had pulled the engine out to have the heads overhauled. Everything went well, I got the engine back in, started it up and it will not go into gear while running. I didn't touch anything else with regards to the trans. I won't assume anything, so forgive what appears to be dumb advice. You've yanked the engine, it's back in, now you can't select a gear whilst the engine is running? Every single last vacuum line in place, checked for cracks/leaking? 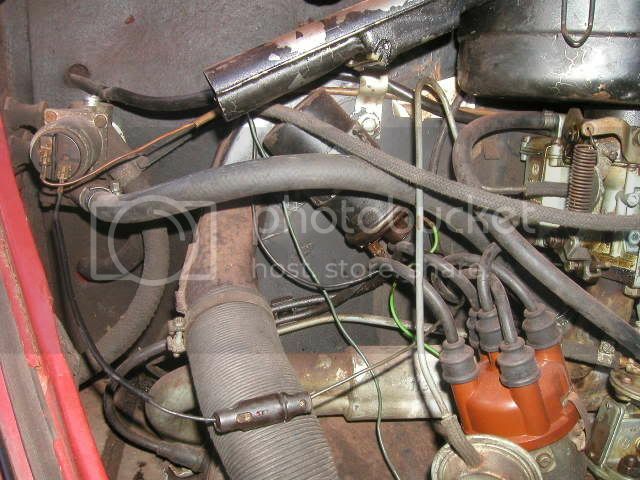 3 large ones (intake to CV, CV to reservoir, CV to clutch servo) and 1 small from the carb to CV (in the correct location!). Looking at Tez's second picture is how they should hook up since his is a single port as well. Clutch servo bladder not leaking and actually moving? Solenoid wires/gearstick circuit functioning correctly? 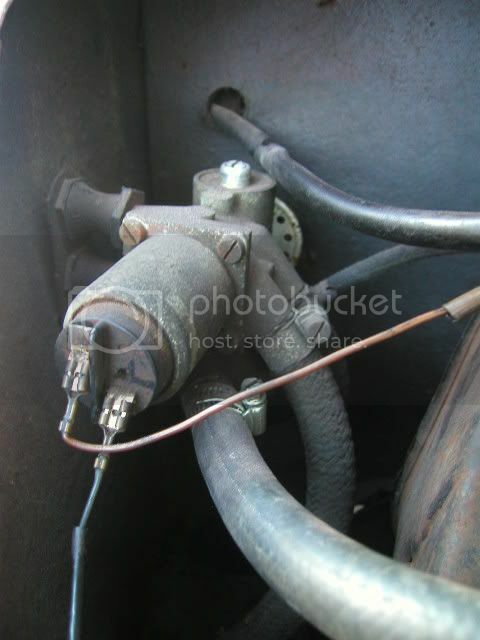 You can test by turning the car on, disconnecting the lead on the CV that doesn't come from the coil and putting a jumper wire between the solenoid terminal and a good ground. Should go click...AND..check every connection from the CV to trans to gearstick. A second person working the gearstick just with the ignition turned on and you listening at the CV will tell you soon enough. I'll ask anyway :? ...your torque converter is bolted up to the flex plate? After that post up on a seperate topic and away we'll all go.....and if you have a digicam, pic's are great!